What has happened to ASU receiver D.J. Foster’s production this season? What happened to D.J. Foster this year? Arizona State receiver D.J. Foster was one of the biggest playmakers on his team; what has happened to his production this season? D.J. Foster had at least 81 yards rushing/receiving in every game against FBS foes in 2014. Only done so twice this season. According to AP Sports, Foster had at least 81 yards rushing/receiving in each game he played in 2014. Yet this season, per Greenspan’s tweet, he’s accomplished such just twice this season. In a recent loss to Utah, Foster was held to 11 receiving yards and -5 rushing yards. 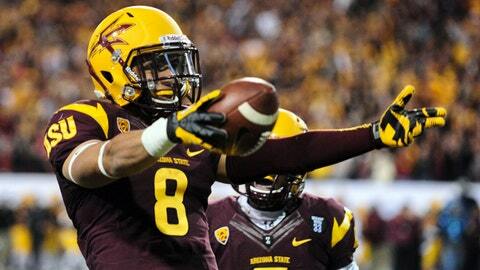 During ASU’s win vs. New Mexico, Foster had just 16 receiving yards and 8 rushing yards. In 2014 vs. New Mexico, Foster recorded 54 receiving yards and 216 rushing yards. "Yeah, I am (healthy)," said Foster, via AZ Central. "I mean, a lot of football played and I think we’re all banged up and stuff. The bye week comes at a perfect time, trying to reload, but I’m healthy."